Sometimes it turns out photos can not be repaired after recovery. Best thing to do then is to use better photo recovery software and recover the files again. Files were originally recovered using Easeus Data Recovery. Case: Contacted via Facebook Chat, 10 or so corrupt JPEG images shot with a Canon EOS 600D / T3i that need repair. Some I can repair, some I can not. As always I try to get clear what happened to the pictures. Turns out, the memory card’s file system is corrupt, card has not been used since. Files were recovered using Easeus Data Recovery Wizard. Out of 2000 or so recovered files, only 300 were intact. Problem with that is, that no one can repair JPEG images if the data was recovered incorrectly in the first place. Best cause of action is, try to recover them again, this time using better software. I step customer through creating a disk image of the memory card. This is a ‘bit stream image’. Each and every piece of data on the card is captured in a file. Customer sends me the file so I can try to recover the files. I run iRecover and Reclaime against the disk image file. iRecover offers a special photo recovery module. Both tools detect files using the (FAT32) file system and also using a header/footer signature scan. The file system scan is disappointing because it produces thousands of files but the vast majority of the files is corrupt. Going through them all is a (too?) time consuming process. I suspect the customer went through the files that were detected using a file system scan by the Easeus tool. This can very well explain the high number of corrupt vs intact files he reports. Since iRecover produces more files (503 for ReclaiMe vs 671 for iRecover) I’ll go with that. After manually sorting files, 73 files turn out to be corrupt. A few can not be opened at all, most corrupt files however can be opened but are distorted. Result, iRecover copies 598 intact files to safety. How about good quality specialized photo recovery software like PhotoRescue. PhotoRescue is pretty quick and performs quite good. It recovers 743 files in total from which 670 are in good condition (determined after verifying results manually). Edit: Ran same card against O&O MediaRecovery, Minitool Photo Recovery Stellar Photo Recovery and CardRecovery. Results added to table. Edit April 21: Added PhotoRec to test results. JPEG Recovery LAB detects 738 JPEG images in total of which 666 are contiguous and intact files, 48 are fragmented but correctly reconstructed and 24 are damaged. So, total for intact files is 714. Fragmentation was a high as 43 fragments for a single 7 Megapixel file! Note: Locality settings were limited to 25% forward / 25% backward so it is possible results can be improved. After copying files are checked and indeed JPEG Recovery LAB copied 714 intact files to safety! If we’d purely look at the number of files that is intact after recovery, JPEG Recovery LAB is the clear winner. If we’d sort by time taken to recover the files, JPEG Recovery LAB comes last. Easeus 2000 1700 300 reported by cs. Test was performed on 5th generation mobile Intel CPU with 8 GB RAM. On a desktop CPU (more cores) with 16 GB RAM analysis time can be reduced to 30 – 60 minutes. One, IMO major advantage that JPEG Recovery LAB offers is the fact that you do not have to go through hundreds of files manually to sort intact vs corrupt or damaged photos. Due to it’s file validation feature, JPEG Recovery LAB is able to sort files automatically. 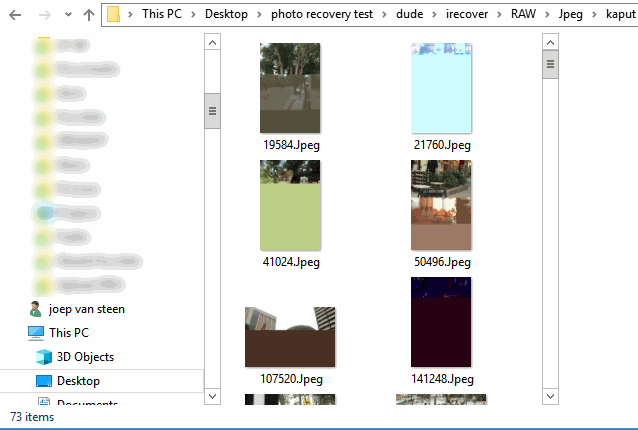 JPEG Recovery LAB automatically sorts damaged files vs intact photos. Files in the contiguous and fragmented folder are all intact. The technology has brought up many recovery softwares that are designed with such awesome features that they are competing for each other. Thus it is clearly visible from this comparative post. This will really help in differentiating between both the EaseUs and the JPEG recovery software as both of them has different purposes to work with. Lost Files & Photos is a very frustrating.. because sometime we lost our important pics that we love it lot… Thanks for the post it will helpful for the users who looking the recovery option.